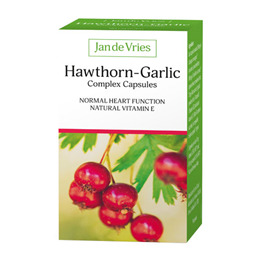 Hawthorn-Garlic Complex Capsules contain vitamin B1 which contributes to the normal function of the heart. They are also a rich source of vitamin E, an antioxidant, which can help protect the body from oxidative stress. 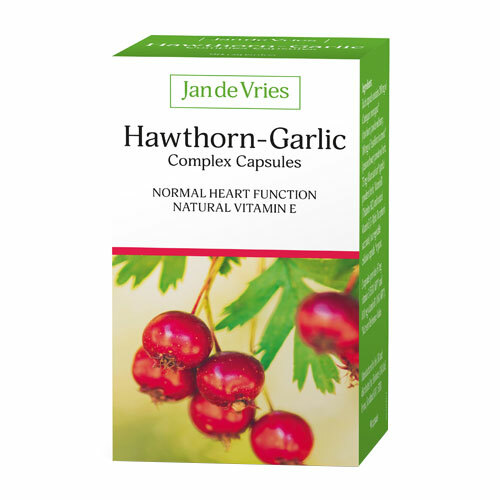 Jan de Vries Hawthorn-Garlic Complex Capsules combine organically cultivated garlic, who`s usefulness has been catalogued back to antiquity, with the pulp of the deep red fruit of the hawthorn, one of the most familiar of hedgerow berries, and the beautiful passiflora plant. Crataegus monogyna* (hawthorn) powdered berry, Passiflora incarnata* (passion flower) powdered herb, Allium sativum* (garlic) powdered herb, Vitamin B1 (Thiamine HCL) and natural Vitamin E (D-Alpha Tocopherol succinate), in a vegetable cellulose capsule. Below are reviews of Jan de Vries Hawthorn-Garlic Complex - 90 Capsules by bodykind customers. If you have tried this product we'd love to hear what you think so please leave a review. medication you can trust been taking 3 capsules at night.